DFBRL8R > I Put This Moment Here. I Put This Moment Here. is an evening of three performances in collaboration between IN>TIME, DFBRL8R, and Zhou B Art Center. Defibrillator invited local artist Po’Chop|Jenn Freeman and Boston-based Marilyn Arsem to be part of the evening program. Po’Chop will perform the piece Dynamite — an exploration into memory and masculinity. It is the re-imagining of traditions. It is finding one’s self within the legacies of those who came before us; a movement piece mining her family’s legacy in Chicago. An influential figure in the history of performance art, Arsem is the subject of a forthcoming book written and edited by Jennie Klein and Natalie S. Loveless, who will be sharing excerpts as part of the program. 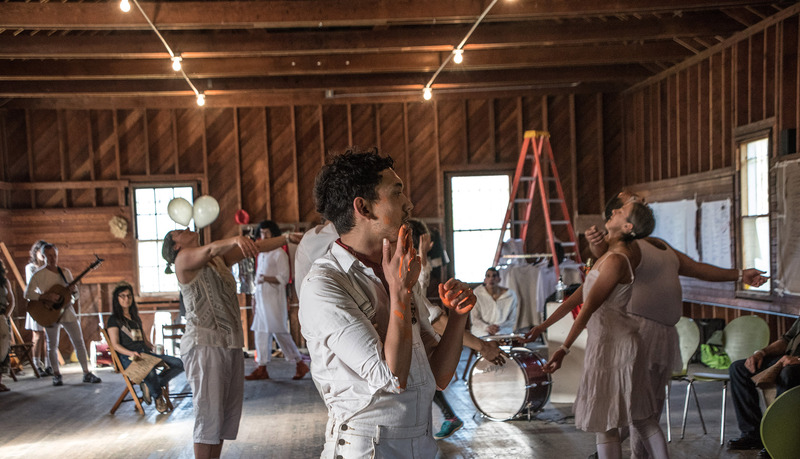 Ryan Tacata is a performance maker, educator, and scholar based in San Francisco. His recent work in performance includes Lolas (2017-, a performance installation in honor of Filipino grandmothers, Asian Art Museum); For You, (2016-) with Erika Chong Shuch (a series of dedicated performances for audiences of 12); and dancing in Doggie Hamlet (2015-) by Ann Carlson (a site-specific dance with four human performers, sheep herding dogs, and 30+ sheep). He is currently writing on ‘the occasion’ with a focus on performance art history and occasional literature. His scholarly and creative work has appeared in Performa, TDR, Performance Research, and SFMoMA’s OpenSpace. He is a lecturer in the Immersion in the Arts: Living in Culture (ITALIC) program at Stanford University. Marilyn Arsem has been creating live events since 1975, ranging from solo performances to large scale, site-specific works incorporating installation and performance. She has presented work in 29 countries in North and South America, Europe, the Middle East, and Asia. Recent awards include the 2015 Maud Morgan Prize of the Museum of Fine Arts, Boston, a 2017 Massachusetts Cultural Council Fellowship, and a 2017 City of Boston Artist Fellowship, and Live Arts Boston project grants. Many of her works are durational in nature, and minimal in actions and materials. Arsem has often focused on creating works in response to specific sites, engaging with the immediate landscape and materiality of the location, its history, use or politics. Sites have included a former Cold War missile base in the United States, a 15th century Turkish bath in Macedonia, an aluminum factory in Argentina, the grounds of an abandoned tuberculosis sanatorium in Poland, and the site of the Spanish landing in the Philippines. Arsem is a member of Mobius, Inc., an interdisciplinary collaborative of artists which she founded in 1975. She taught at the School of the Museum of Fine Arts, Boston for 27 years, establishing one of the most extensive programs internationally in visually-based performance art. She continues to teach performance workshops internationally. Po’Chop is a Chicago-based performance artist who uses elements of dance, storytelling, and striptease to create performances and inspire students and collaborators across the country. Po’Chop has performed at the Brooklyn Museum in Brown Girls Burlesque Bodyspeak, and headlined shows in New Orleans, Kansas City, Minneapolis, St. Louis and New York. Po’Chop is an Advisory Board Member for High Concepts Laboratory and a Board Member, Cast Member, and Workshop Leader for Jeezy’s Juke Joint, an all black burlesque revue. Po’Chop performs on Netflix’s Easy (Season 2), appears in music videos for songs by Jamila Woods and Mykele Deville, and is a muse for co-created experimental dance films such as Home | Here. Po’Chop was selected as the recipient of the Chances Dances Mark Aguhar Memorial Grant in 2015, awarded as a 2017 3Arts Make A Wave Artist and was recently selected as a 2018 Chicago Dancemakers Lab Artist. Jennie Klein is an art historian who writes on contemporary art, performance art and the intersection of gender and visual culture. She received her Ph.D. from the University of Southern California in 1998. Dr. Klein is presently completing two book projects. The first, tentatively titled Responding to Site co-edited with Dr. Natalie Loveless under contract with Intellect Press, is an edited collection on the work of performance artist Marilyn Arsem. The second, Assuming the Ecosexual Position, under contract with the University of Minnesota Press, is a compilation of the work and writing of Annie Sprinkle and Elizabeth Stephens. Dr. Klein is Editor of Letters From Linda M. Montano. London: Routledge, 2005 and has also been published in PAJ, Frontiers, Journal of Lesbian Studies, Feminist Studies, N. Paradoxa, ArtPulse, Art Papers, New Art Examiner, Genders, and Afterimage. Dr. Klein teaches courses on contemporary art and theory, performance art and theory, the intersection of gender and art, and serves as the Director of Studies for the Honors Tutorial College at Ohio University. Natalie S. Loveless is an associate professor at the University of Alberta, where she teaches in the History of Art, Design and Visual Culture and directs the Research-Creation and Social Justice CoLABoratory (researchcreation.ca). Her forthcoming book with Duke University Press, How to Make Art at the End of the World: A Manifesto for Research-Creation, examines debates surrounding research-creation and its institutionalization, paying particular attention to what it means – and why it matters – to make and teach art research-creationally in the North American university today. She recently completed New Maternalisms, a project bringing together feminist art practice, theory and curation, and an interdisciplinary collaborative project on global vaccination called Immune Nations that culminated in a high-profile exhibition at the United Nations in Geneva during the 2017 World Health Assembly. Loveless currently co-leads Speculative Energy Futures, a multi-year project that is part of the Just Powers initiative funded by the Future Energy Systems CFREF and a SSHRC Insight grant (justpowers.ca), and, during the 2018-19 academic year, is in residence as a visiting scholar in the Centre for Interdisciplinary Studies in Society and Culture (CISSC), where she is developing a new project, Sensing the Anthropocene: Aesthetic Attunement in an age of Urgency. Founded in 2010, DEFIBRILLATOR GALLERY (a.k.a. DFBRL8R or dfb) is a 501(c)3 arts organization dedicated to fostering local makers while invigorating Chicago by bringing to the city artists of exceptional calibre from around the world. Focusing on ephemeral and time-based artistic practices, DFBRL8R contextualizes performance within visual art, embracing those who look to the body in concert and conversation with time, space, object, architecture, and society. Providing opportunities for established and emerging artists alike, DFBRL8R is a platform for underrepresented voices and time-based work that does not sit comfortably within pre-established genres or disciplines. Dynamic programming, decidedly fearless and unique, aims to provoke thought and stimulate discourse. We foster and contribute to a global dialog surrounding conceptual, ephemeral, or enigmatic forms of expression. Zhou B Art Center is a private non-government funded complex founded in 2004 by the Zhou Brothers in Chicago’s historic Bridgeport neighborhood, Zhou B has a mission to engage in cultural dialogue through contemporary art exhibitions and international programming.